Utility poles are hardly immortal. They age beyond useful life. They rot and are damaged by elements, human activity and nature. Pole owners decide to replace them with structures made of new and different materials, such as swapping a wooden pole for a metal one, for example. Lines are buried. The point is this: Change happens in the field—it is a constant. When pole transfers are required and requested, a time limit is set to ensure assets are moved quickly from old pole to new, so the decommissioned poles do not end up standing next to their newer brethren, clogging views and creating liability. While this time limit varies from state to state and territory to territory, 45 days is typical. However, we all know things do not always go as planned, creating backlogs, double wood, as well as confusion and disconnection between companies in a joint use relationship. What happens when equipment is not transferred before the clock runs out? The equipment owner assumes ownership of the decommissioned, sometimes damaged, sometimes dangerous pole and no one wants that on their books. Solving the problem, however, begs a look at the symptoms. So, why would any company wait too long to move their equipment? Why do many transfer requests go unaddressed during the allotted time for completion? Here are three compelling reasons. Within the daily routine of joint use, many companies are able keep up with pole transfer requests. Some roll in every few days, weeks or months and internal staff is adequate to keep up with demand. But what happens when special projects eat up time and resources? What happens when a beautification project suddenly demands an entire riverfront of cable is buried so the view is not impeded, for example? Internal staff may find they are unable to complete all transfer requests in the allotted time. The clock simply ticks on as employees rack up hours, keeping up but never getting ahead. Imagine that in a formerly quiet territory, the economy suddenly swells and growth booms. Or, alternately, acts of nature damage or destroy a large number of field assets. The first creates high demand for new attachments; the second creates high demand for maintenance. Both gobble up resources and both of these scenarios are out of your control. These scenarios can result in widespread backlogs if internal staff is unable to keep up with demand. In the end, time limits on transfer requests are in place for everyone’s safety and to keep the system running. 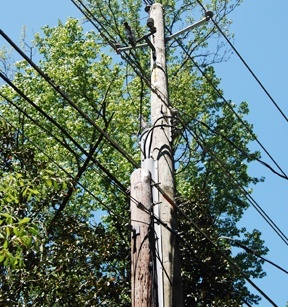 If utility pole transfer backlogs are a problem at your company, start at the source, determine where the breakdown happens, and explore options that will allow you to beat the clock. Time’s ticking: what will you do?